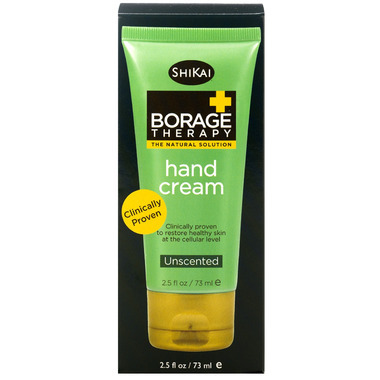 ShiKai Borage Therapy Hand Cream is an OMEGA-6 product that is specifically formulated to relieve dry cracked skin in just days AND promote the growth of healthy new skin cells for long-term benefits. This lotion bring relief to those who suffer from chronic dry skin and some forms of atopic dermatitis and eczema. Plus it penetrates quickly so there's no slippery after feel. Works. But smells terrible. A strong sour overpowering smell. Tried to use it on my kids, and they hate the smell. The best hand cream I 've ever tried...you can feel the difference hours after applying it. This is the best hand cream I have ever used. I had a patch of very dry skin, almost scaly on one of my fingers for at least 6 months, and this cleared it up pretty much overnight! lasts a long time too on your hands, and it is nice that is has no fragrance and is safe (#2 rating on environment working group). I have been using it on my 1 year old who has very dry cheeks, and it is awesome for that too. I will try their foot cream soon! Really fabulous product. Will buy again. Also very important to me that this is a cruelty-free product, not tested on animals. If you suffer from dry skin during our long dry Canadian winters, this product is you. The borage oil component seems to be what makes it work so well compared to other more traditional moisturizers. It's truly amazing! !